It’s always hard to say goodbye. You spent the last few days being absolutely pampered at a gorgeous resort on Bali. Between your own private plunge pool, the cliffside spa, and the rooftop bar for sunset cocktails, it was heaven. But it’s time to move on. So you board a ferry that’s bound for a smaller, much smaller, island. You can already see the Gili Islands in the distance. 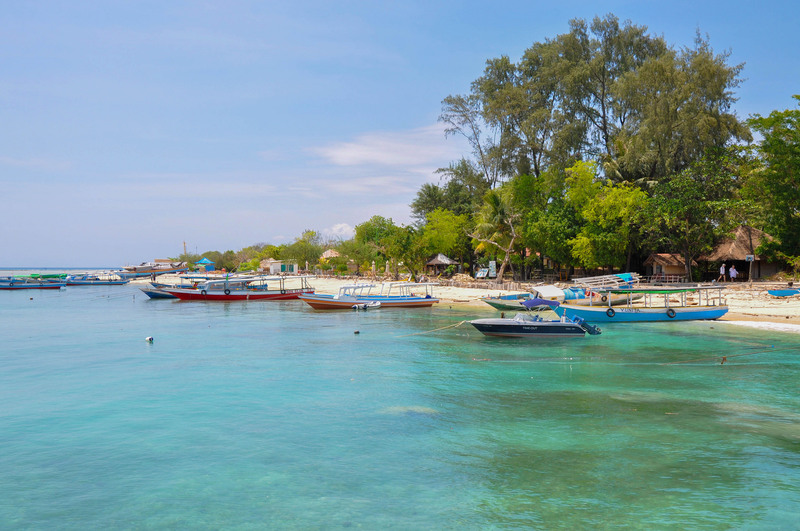 The Gili Islands, an archipelago of three small islands, lie in the Lombok Strait off the northwest coast of Lombok. The islands were uninhabited for centuries. Fishermen and farmers, who established coconut plantations, eventually arrived. With no fresh water, villages didn’t thrive. Until tourists discovered them. Backpackers came first; a party atmosphere, due to the lack of law enforcement, came with them. Scuba divers followed, once they realized that world-class dive sites surrounded the islands. Now there’s an eco-friendly vibe, as people want to protect both the islands and the reefs around them. You’re heading to Gili Trawangan, the largest and most remote of the three islands. Most people live on the east side of the island. When the ferry arrives, you find colorful boats and dive shops, seafood restaurants and beachfront bars, little hotels and a turtle sanctuary. The island is full of mangroves and coconut groves. A footpath rings it; it takes about 90 minutes to walk the circle. You see bikes and cidomos (horse-drawn carriages) along the way, since motorized vehicles are prohibited. It has a Tulum, Ambergris Caye, or one of numerous Thai-islands vibe. Though you’ll surely return to hang out, you’ve decided not to stay right in the center of things. Unlike the east coast, the north coast is always quiet. You find the Desa Dunia Beda Beach Resort hidden in the dense greenery. Except for some scattered red bean bag chairs, the white-sand beach in front of it is empty. While the view of the Bali Sea is uninterrupted. The resort is made up of just 12 standalone villas. 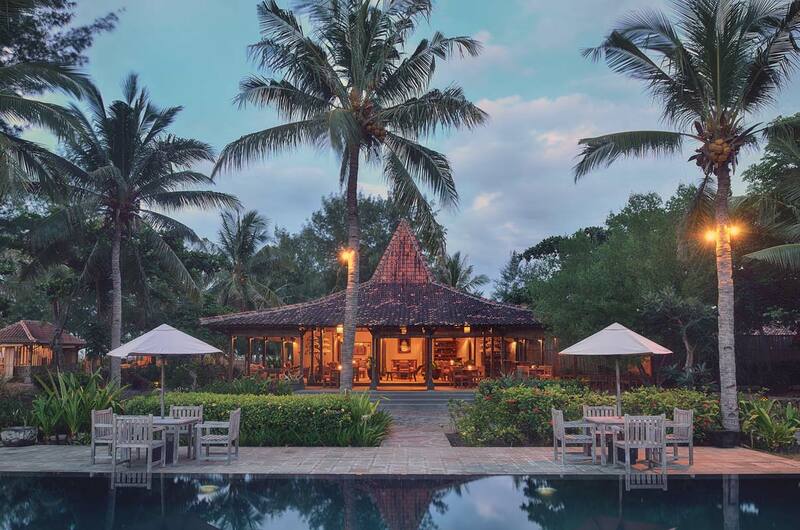 They have a traditional Javanese style with red-tile roofs and open-air bathrooms. You find antique wooden furniture, a canopy platform bed, and kimonos inside. Plus the spacious balcony, featuring a daybed, extends the entire length of the villa. There’s a long, saltwater pool lined with wooden sun loungers. The smell of grilling seafood swirls around the open-air restaurant. A colorful dive site, the Coral Fan Garden, lies just offshore. A tapas restaurant is a short walk down the beach. There’s even stunning views of the Gili Islands, Lombok, and Bali if you climb the Hill at the southern end of the island. It’s especially breathtaking at sunset. Gili Trawangan definitely isn’t as luxurious as Bali. You didn’t expect it to be. The little island feels more rustic and laid back at first, more authentic and Indonesian once you start to settle in. It might be even harder to say goodbye here.